Though Grapevine, Texas has been her home for over thirty years, Sonya Terpening graduated high school and lived many years in Oklahoma. She feels that living in Oklahoma and Texas is living with the fable of the west. Both states are so rich in history and legend that as an artist she cannot help but seek it out and try to share it with others. Sonya never made a great decision to become an artist; she just always knew that is what she wanted to be. Sonya studied with professional artists from the time she was in junior high school. She received an art degree at Oklahoma State University. She continued to refine her work by studying with and knowing some of the great American artists such as Richard Schmid, Bettina Steinke, Donald Teague and Lowell Ellsworth Smith. Sonya Terpening's art is about sharing the great and fascinating world around her. "When something moves me, be it a story or a scene, I want to express it in color and light so that the viewer can share the feeling. There is nothing more beautiful than this great land and the people living in it. I am drawn not only to the American west as it exists today but also to its history. There is something about the past that we all share that makes us better for remembering it. I think art touches the soul and teaches in ways words cannot." Sonya has been an invited artist to the “Prix de West Invitational” at the National Cowboy and Western Heritage Museum for twenty five years and to the Masters of the American West at the Autry Museum for twelve years. In 2008 Sonya was awarded the Gold medal in Watercolor at the Masters of the American West Show. 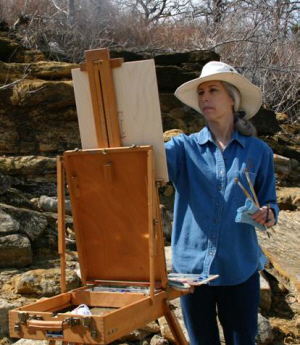 She was a featured artist at the 2006 Rendezvous at the Gilcrease Museum. She is the 2014 recipient of the National D.A.R. “Women in the Arts Recognition Award.” In 2010, she was the inaugural recipient of the “Smelser-Vallion Visiting Artist for the Doel Reed Center for the Arts" award from Oklahoma State University. She received the award a second time in 2013. In 2018, she was named Outstanding Alumni in the Arts by OSU College of Arts and Sciences Articles about Sonya's art have appeared in "Western Art Collector", "Art of the West", Southwest Art" and "Persimmon Hill" magazines.